Recently 3D printing has expanded printing edible materials, metals and concrete. However, in the most common application (plastic) 3D printing is often overlooked as it’s considered harmful to the environment. Although there are alternatives, PLA (Polylactic Acid) is a biodegradable, naturally synthesized plastic made from starch (mainly corn) or cassava roots. In comparison to ABS (Acrylonitrile Butadiene Styrene), PLA is marginally weaker with a 5% smaller Young’s Modulus. However, PLA is only suitable for model making, small applications, etc. due to ABS higher impact strength making it better suited for mechanical purposes. There is an array of different 3D printing processes including; SLA (Stereolithography), FDM (Fused Deposition Modelling) and SLS (Selective Laser Sintering). FDM is the most popular of these, due to the simplicity with?SLA close behind due to the availability of affordable desktop printers. As you can see SLA (especially in desktop) offers a smoother transition between layers that go undetected by the naked eye. Based on the level of detail, SLA is more effective of producing complex structures and to a smaller scale. 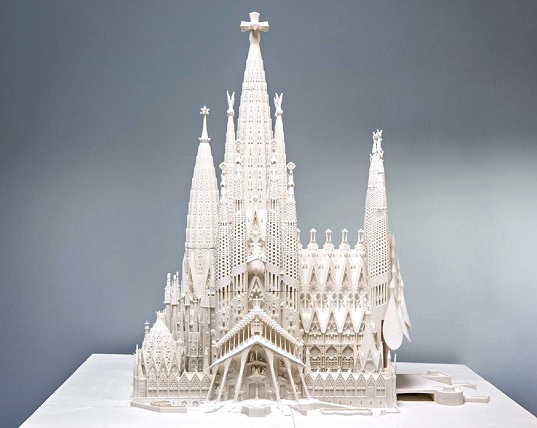 3D printing plays an important role in the architectural design process in addition to 2D technical drawing and rendering techniques. The 3D element helps to translate the design into a scaled, built form that engages clients and communicates the concept to other design team members and even the public. The 3D printing industry has recently revolutionised the construction sector where a house has been erected in less than 24 hours, providing a solution to low-cost housing. This technology requires fewer construction workers, therefore reducing human error and saving a considerable amount of time as it’s as simple as push and go. The CAD (Computer Aided Design) data is directly translated into an .STL file and converted into lines of g code which is read directly by the machine as co-ordinates and commands.